UPDATE: Audubon has created ethical guidelines for photographers. Audubon has a link to help you know when birds think you’re too close to their nest..
Wildlife photographers shoot birds without hurting them—usually, at least. 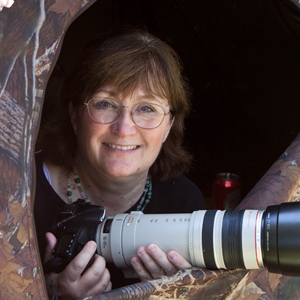 The relatively new technique of digiscoping—photographing birds through a spotting scope—allows photographers to get great photos of natural behaviors at much longer distances than they could with more affordable lenses. But no matter what technique is used for photographing birds, care should be taken so that the birds aren’t harmed. Disturbing vegetation around a nest is not only unethical but usually illegal. Searching out nests can sometimes attract opportunistic nest predators, especially crows and Blue Jays. And luring birds of prey with pet-shop rodents can be extremely dangerous near roadsides; it also risks spreading diseases from captive animals to wild populations. Nowadays, far more people are exposed to wild birds via photographs and video than by spending time in the natural world. When wildlife photographers conscientiously follow safe practices, they provide educational opportunities of inestimable value for conservation.